So up until 1 Samuel, Israel has never had a king – just spiritual leaders/warriors like Moses, Aaron, Joshua, etc. Well, they started getting a little jealous of all the other tribes and nations that had kings to rule over them, while all they got was an intimate relationship with the Author and Creator of the universe and life itself. So they whine until God tells Samuel (the main prophet at the time) to anoint a guy named Saul as king. It doesn't take long for the power to go to Saul's head and he starts getting a bit paranoid and crazy. And that's when we arrive at what is probably the most well known underdog story ever: David versus Goliath. You may have thought that Samson killed all of them, but those pesky Philistines are still around (and now they've got giants!). 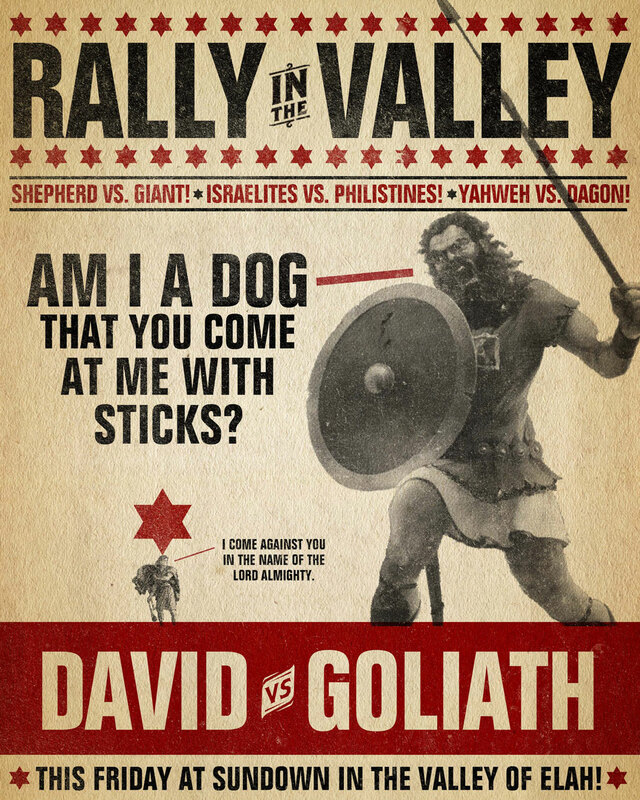 The Israelites and Philistines are having a standoff in the Valley of Elah and there's a big strong dude named Goliath who is taunting the Israelites (and Yahweh) and really wants to fight somebody. It's at this point that we meet David. David is a young shepherd who hears about Goliath taunting the Israelites their God and just can't take it anymore. He decides to take a break from his day job and go out and fight the bigger, stronger and heavily favored Goliath. Against all odds, David (with help from Yahweh) puts the smack down on Goliath and the Israelites defeat the Philistines yet again. Philistines, will you ever learn? Don't mess with Yahweh! Shortly after that, David ends up becoming king. He's very important for a couple of reasons. First, he's a good king. He has his faults, but all in all, he's fair, just and seeks God's heart. Second, his family line becomes extremely important, specifically one of his relatives a few hundred years down the road.